Thomas Moran was an American artist famous for his paintings of Western American landscapes. His stunning watercolors and sketches of the Yellowstone region, the Grand Canyon and Yosemite National Park played a major role in the creation of a U.S. National Park System in the early 20 th century. More than 80 years after death, Moran's paintings are still considered among the finest examples of western landscape painting. Born in 1837 in Bolton, England, Moran was the son of a handloom maker who immigrated to the United States in 1844. He started his career at 16 working as an apprentice at Scattergood & Telfer, a local wood engraving store in Kensington, Philadelphia. His interest in watercolors and sketching blossomed during this time and Moran soon found himself a job as an illustrator at Scribner's Monthly, a major American literary publication of the era. 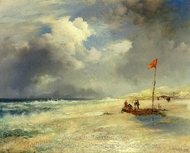 While at Scribner's, Moran became familiar with the work of J. M. W. Turner, a British artist whose paintings heavily influenced Moran's work in later years. In 1860, Moran traveled to Lake Superior and produced several landscapes of the Great Lakes region, the lithographs of which he later sold to several local collectors. Later that same year he was appointed as the chief illustrator for Scribner's and his work began appearing in several major magazines around the country. In 1871, Moran was assigned to illustrate an article in Scribner's called "The Wonders of Yellowstone," written by Nathaniel Langford, a man who had participated in an expedition to Yellowstone in 1870. Langford's vivid descriptions of Yellowstone piqued Moran's curiosity and drove him to take part in an expedition to the park later that same year. Moran was immediately captivated by Yellowstone's unusual landscape. Over a period of 40 days he proceeded to faithfully record his impressions of Yellowstone in a series of watercolors and sketches that would forever change the nation's perceptions of the area. The exquisitely detailed Moran paintings of Yellowstone captivated the nation and thrust the artist to national prominence. Moran's work also inspired Congress to declare Yellowstone the nation's first national park. 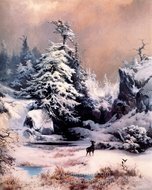 Over the next several decades, Moran gained considerable fame and wealth as America's foremost Western landscape painter. He travelled extensively around the country and Europe and eventually moved to the American west. He died in Santa Barbara at the age of 89 in 1926. During his life, Moran painted several exquisite watercolors. Computer maker IBM and the Santa Fe Railroad presently own a vast majority of Thomas Moran paintings. 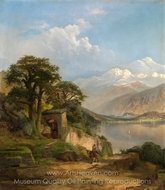 Several Thomas Moran paintings are also held by the Cooper-Hewitt National Design Museum. Despite his prolific output of paintings, Moran is perhaps best known for his landscapes of the Yellowstone National Park and surrounding areas. Many consider Moran's paintings of the park as the best embodiment of his sincere respect and love for the vast and magnificent landscapes of the U.S West. 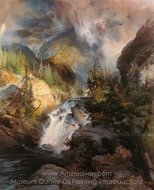 His most famous painting is titled the Grand Canyon of the Yellowstone and was done during his first visit to Yellowstone in 1871. The massive painting, measuring over 8 feet by 13 feet, depicts Yellowstone's Lower Falls and is stunningly accurate in its rendition of the yellow sulfur-stained rock commonly found in the park. The U.S. Congress purchased the painting for $10,000, a startlingly high figure for its time. It currently is part of the Smithsonian Art Museum's permanent collection. Moran's The Teton Range painted in 1895 is another of his many memorable paintings. The painting is Moran's rendition of the majestic Grand Tetons mountain range of northwestern Wyoming and is currently a part of the White House's collection of American masterpieces. 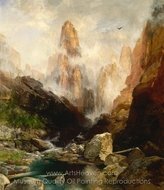 Other famous Thomas Moran paintings include The Chasm of the Color from 1872 and The Woods in Autumn from 1874.